Many years ago, my husband and I decided we wanted to watch the movie, Zodiac, starring Jake Gyllenhaal. We went down to our local Redbox machine to pick up the movie. We grabbed a six-pack of beer, some snacks and settled in to enjoy the film. About thirty minutes into the movie, one of us commented that it was odd that we hadn’t seen Jake Gyllenhaal yet, but we kept watching. An hour past; no Jake. We kept watching. Then, the screen went black, in the moment just before the credits rolled. And somehow we were still expecting Jake Gyllenhaal’s appearance. He never appeared. Turns out that we had rented The Zodiac, starring nobody you know. The length of time it took for us to discover our mistake leaves some room for concern. And then there are movies whose titles sound similar, yet whose content is nothing alike. This can also lead to some interesting mishaps, like the time our father intended to record The Goonies for my young sisters and I to watch as children. Had he truly recorded The Goonies, we surely would have enjoyed watching the movie together. But, my well-intentioned father had not in fact recorded The Goonies. What he had inadvertently recorded was a horror movie about small toothy monsters called Ghoulies. The movie opened with a terrifying scene which gave us nightmares for weeks afterward and caused me to discard my once favorite nightgown, which was creepily similar to the one worn by a short-lived character in the opening scene; the opening scene which will forever be burned into my mind. Note to self: Double check that I have in fact recorded Mickey Mouse Clubhouse for the kids to watch and not Mickey Mouse’s House of Torture and Pain. Watching tv can be tricky. Good food doesn’t need to be. 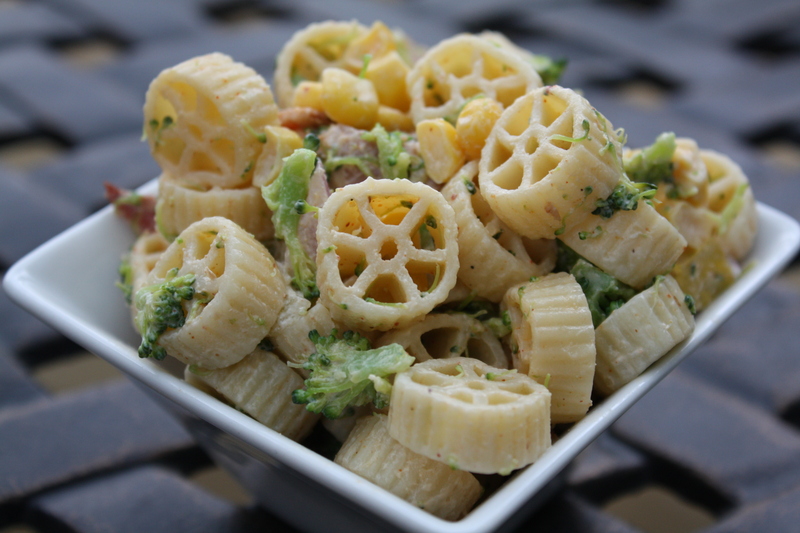 This family-pleasing pasta salad marries sweet summer corn with tender broccoli and crispy bacon in a spicy ranch dressing. It’s a perfect balance of flavors and textures which would make a great summer side salad for your next picnic or barbecue. There’s no room for confusion here. This is good stuff, people! To make the dressing: Stir together the sour cream and mayonnaise, until smooth. Add the lemon juice, salt, pepper, dry mustard powder, onion powder, garlic powder, and paprika. Stir in the chopped chives, diced chiles, chile powder and cayenne. Taste and adjust seasoning, as desired. 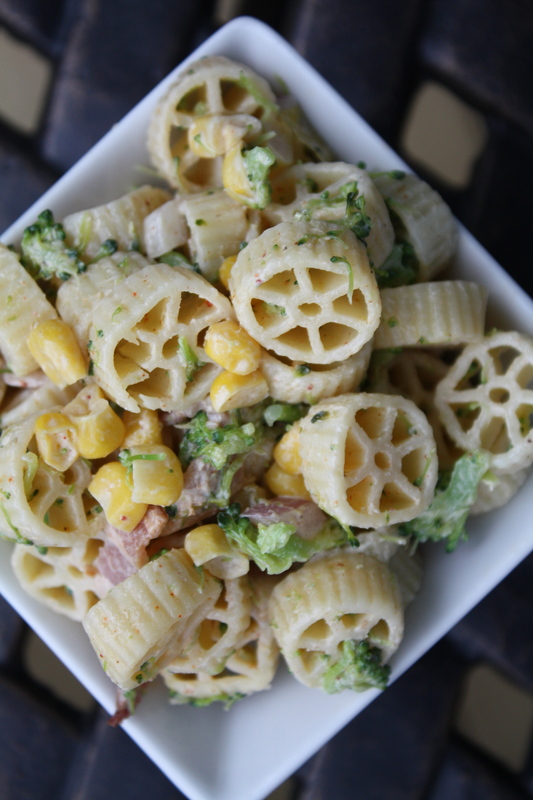 Toss the pasta, broccoli, corn, and bacon with the dressing. Refrigerate until serving. *You can adjust the quantities of chiles and cayenne pepper based on your family’s preferred level of spiciness. As written, it will produce a medium spicy dressing. Posted in Food, Recipes, Salads, Side Dishes, Vegetable and tagged Cooking, easy dinner, family, Food, kids, life, pasta, Recipes, salad, summer, vegetables. Bookmark the permalink. Wasn’t ghoulies the one with the creature popping out of the toilet? I remember that movie but am not sure I ever saw it. The Goonies was watched many many times. 🙂 Thanks for the laugh! Haha…yes, the poster for the movies has the monster in the toilet, though I never watched that far into the movie to see that part! Hi Amy, I’m new to your blog and have really been enjoying the posts and the recipes. Are most of your recipes intended to serve 4? I’m wondering about adjusting for more or less people. Thanks!! Hi Dawn! Thanks for your comments. Sorry about the lack of serving size information. I need to get better about including that information consistently. Many of my recipes are just about right for 4 people, though some serve more. This spicy bacon ranch pasta salad, for example, would probably serve about 8 as a side dish. Thanks! I have to try the Bagel Casserole. I live in Boston but I’m from NJ, so I know what you mean about hating to waste those delicious bagels!